Oasis Park Square is a newly announced residential project in Doral that is scheduled to begin construction in June/July 2013. This exclusive gated community, located at NW 33rd Street and 82nd Avenue, will be situated in the heart of the city within very close proximity to excellent shopping as well as top rated schools and the major thoroughfares through all of South Florida. Oasis Park Square will be adjacent to the Doral Resort and Spa as well as Miami International Airport making this an upcoming ideal neighborhood in which to live for families, business people, retirees and, even those who have second homes in South Florida. This upscale neighborhood will offer the amenities and conveniences that one expects to find in a community of this caliber. From the quality of construction to the features inside each home to those throughout Oasis Park Square, those interested in buying top of the line homes will definitely find that this is a neighborhood worth consideration. Construction. The structure of the units will be made of concrete block with steel reinforced and tie beam construction. 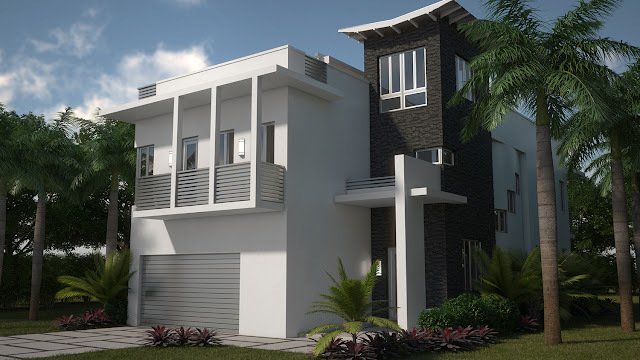 With a smooth stucco finish, high impact windows and glass doors, these homes will be built with a contemporary architectural style and top quality materials that give the homes the sound foundation and strength that homes in this part of the country must have. Home Features. Nothing is spared in the design of the homes in Oasis Park Square. 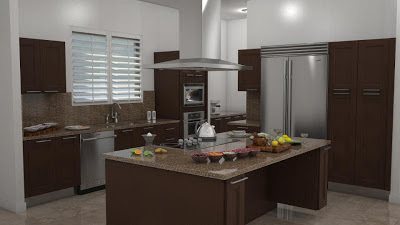 High ceilings in large, spacious rooms that make these homes will highlight the detail that goes into the construction. The gourmet, chef-quality kitchens will feature quartz counter tops and back splashes stainless steel appliances and fixtures as well as Italian cabinets. Bathrooms will have a spa-like feel with marble counter tops porcelain floors, designer faucets, fixtures and more. Other details are smart home technology, built in security systems, wine cellars and other features found in the most expensive South Florida homes. Community Features. When residents and guests enter this exclusive community, they will first go through a guarded gatehouse. Inside the neighborhood, there will be brick pavers at every intersection as well as the entry, decorative street lights and wall surrounding the entire community, a beautiful community pool and club house that features a cabana and sundeck, and lush, tropical landscaping. Homes in Oasis Park Square will be on par with homes in many of the nicest neighborhoods throughout Miami-Dade County and all of South Florida. Size and Floor Plans. The neighborhood consists of single family homes ranging in size from just over 4,000 square feet to almost 6,500 square feet. With four models from which to choose, home buyers will have the chance to select one of two elevations with each model that are either four or five bedrooms and offer the option of a rooftop terrace that measures over 1,700 square feet. Move-in is expected to begin in about February 2014. Oasis Park Square brings luxury to Doral real estate. With such a draw for professionals and families, Oasis Park Square is definitely a wonderful addition to the community. Are you kidding me. First off, there is no demand in Doral, FL for 800k+ homes at all. Secondly, the location in which these homes will be build is in the middle of Doral industry. There are no schools nearby, there is no nightlife, and arguably it is on the opposite side of town from rural neighborhoods and grocery stores. I can not believe the council people of Doral agreed to this. Stop trying to make Doral to be downtown Miami...it just doesn't have the ability to be that way. Offcorse there's Venezuelan demand in Doral to buy these homes and at much higher prices, but appart from Venezuelans trying to rescue their money from Maduro, who's left? NO ONE!!! These people coming to Miami don't care how expensive it is, they just prefer to have their money here at Doral rather than Venezuela (anything outside Venezuela is better no matter if it's overpriced). It is expensive, indeed. I don't have the money to buy there, but if i would have it, for sure i would buy there. It is gorgeous ! Even that is in the middle of the industrial side of Doral, location is great, because is on the center. Not only for Venezuelan people, that is for all those who can afford that and have good taste. Note: I am Venezuelan. This has nothing to do with envy, and it has everything to do with common sense. For starters, Doral's zip code does not end with 90210, so clearly properties along Doral are over prized, because some "dodo foreigners" are willing to over pay for a piece of property. Moreover, by your comment, its evident that your far from being the "educated & affluent" person you would like to be, its obvious that your an average joe attempting to be someone your not. wonderful residential building construction.Above the house picture is very beautiful.The building design is so nice.Thanks for sharing a great information. And where are you from that you are so ignorant to call Venezuelan people "pretentious"? No question, there are Venezuelan "pretentious" people, but NOT ALL VENEZUELAN ARE LIKE THAT. I am Venezuelan, and nothing but pretentious. I have to agree with you about the price is high compared to other areas that includes Marina & or beach view, but seriously, get more educated regarding Venezuela. A million is kind of steep for Doral area, nevertheless, OASIS project seems good for HGTV. I live at Doral, and i don't think is the fanciest city ever. I am a middle class working person, Venezuelan, and i like Doral because is well loated and accesible area, clean and nice. Rather "pretentious" people, than ignorant. Sorry. I grew up in Fountainbleau Park in the 70's. One of my fondest memories in childhood was my Venezuelan friends that would come and spend the summer here and then leave when school started. Venezuelans always have had second homes in Fountainbleau when it was considered a nice upper middle class neighborhood . When Fountainbleau changed so did theVenezuelans. They stopped buying condos with golf course views. My point is that affluent Venezuelan buyers have always existed in this area. So when Doral was first established of course it was an upper middle class Venezuelan community. Upper middle Venezuelans have always bought in this are. It just changed from Fountainbleau to Doral. I personally like the location of Oasis.. It is very centrally located. What people don't realize it is an advantage to have it in an industry area. That means that after five o'clock the snor rounding neighborhood is quiet. I rather have that than live in a loud neighborhood at night. I can't afford the prices of the Oasis or for that fact the Ivy which is the Oasis community but in steroids and the price tag to match, but if I could I would. People should know the history of an area before they start to criticize. I am Cuban American and ESOL teacher. What is sad to me is the Latin community is not united and we are the largest mi ority group in the country. One country thinks that they are better than another for what ever reason. The sad part is when you leave Miami and your Latin regardless of what your social economic status is everybody thinks that you are Mexican and illegal. I don't mean to get polical, but the Latin down fall is that we are not united. Some Nasty and hateful comments for no reason.. sad to say the least.... People if you have the cash go for it. I love the design but then again all the houses will look the same so there is no originality on the concept. It will be a sub within an Industrial complex. Where are the trees, the pathways for walking your kids, dog and jogging? for real no lakes or views? 5 models with variations is not original so the concept is not original either. I do love the rooftop Jacuzzi and BBQ;I can only think about my Friday night after work on the rooftop listening to some music and having a couple of drinks. Aside that this is an overpriced sub near 826. blah, blah blah... I rather for that price be closer to the beach but then again I like to live away and go play on the weekends near civilization and I do hate condo's.. I need a garage. bottom line. I do hope one of my friend buys a unit with roof top Jacuzzi... I bring the drinks.. LOL. I am a Brazilian, I live and have my own business located in Doral since 1992. Moved from Aventura to have a better location for my business. During this time I had 2 daughters born and raised in Doral. No regrets at all. 76.4% of residents would recommend Doral as a place to live and work and 95.6% rated the quality of life as good/excellence. I really don't think all these facts are wrong and some critic Posters are right. Let's get educated before make our comments and decisions.